Our house full of musicians gets really excited when a new album comes onto the premises. It's always fun for us to pick up new music and especially from "new to us" artists. I also love to promote new artists since I realize praise and applause are near and dear to every singer's heart (mine included). I want to be able to like new albums but that's not always the case. 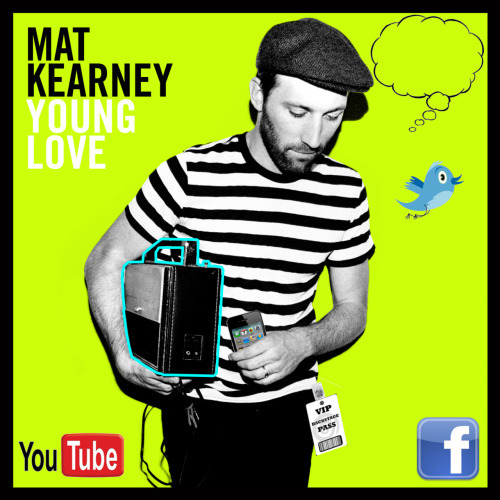 I was sent Mat Kearney's album "Young Love" review. This is Mat's 3rd album although I wasn't previously aware of him. Mat's voice is a mixture of Jack Johnson & Dave Matthews (both of whom I really enjoy) with a dash of the Plain White T's front man Tom Higgenson (one of Diva's favorite bands). I like that slightly raspy drowsy-voiced hipster kind of sound. The very first track on the album, "Hey Mama!" is written about his first encounter with his wife, very sweet and also a pretty catchy tune. But, either the CD production or the distortion of the electric guitar was such that it actually hindered my enjoyment of the song. Confession time: it took nearly a dozen plays before I actually concentrated on the music. "Young Love" is unoffensive to the point where it is perfect background music. And dare I say it, boring. After fifteen or sixteen plays and some real concentration, I still felt it had a white noise affect on me. I think I have figured out why that is - it is monotonous. The album as a whole is "same-y" as is each song within the album. You know how track #8 on an album is kind of like a filler? A throw away track? It would be the track that you wouldn't necessarily sing along with or skip other tracks in order to get to it. Well, unfortunately, for me, it felt like it was an entire album of #8s. I could hum a repeated pattern of starting on a note, going up a half step, back to the starting note, and down a whole step for every single track on the album. That's besides noting that every song started with several bars of rhythm then vocals jumped in. Every song. So it was too rhythmically and melodically repetitious. Too obvious. To recap: hipster, unoffensive, and repetitious which makes "Young Love" good background music, especially for a coffee bar. You can see his video here for the first track on the album "Hey Mama!". Who knows, maybe you'll find him more interesting than I did and disagree with me totally. *My review is my personal opinion. I was sent a copy of "Young Love" to review and have been entered to win a gift card through One2One Network for participating.